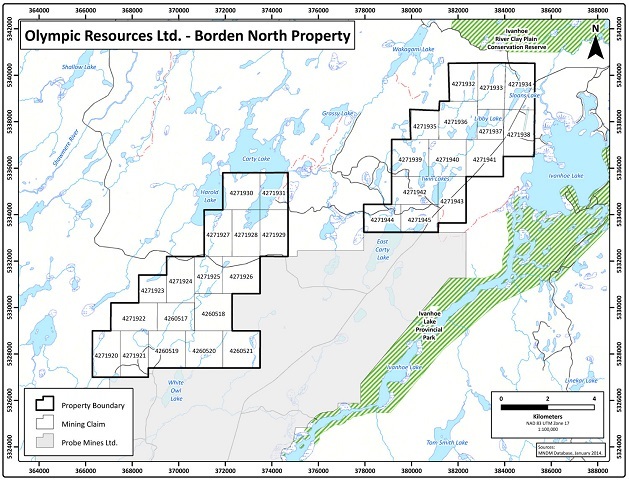 The Borden North property is situated along the southern flank of the Kapuskasing Structural Zone approximately 50 kilometers northeast of Probe Mines' Borden Gold project in Northeastern Ontario. It can be reached via Highway 101 from either Wawa or Timmins and then by a series of gravel forest access roads that traverse both claim groups. The Borden North property lies along the southeastern boundary of the Shawmere Anorthosite Complex which, in turn occupies the eastern portion of the Kapuskasing uplift in north central Ontario. The Kapuskasing uplift is a northeasterly striking, 500 km long, Paleoproterozoic thrust structure cutting Archean stratigraphy and exposing high grade gneissic rocks. The target mineralization on the Borden property will be similar to that of the Borden Gold project, situated approximately 60 km to the west-southwest. At Borden Gold, significant gold mineralization occurs within a sequence of feldspar, chlorite and biotite altered metasedimentary horizons and minor felsic to intermediate intrusions. Gold is associated with variable amounts of pyrite and pyrrhotite mineralization. There is no quartz veining associated with the gold mineralization. At Borden Gold the Sharpstone Geoservices Ltd. 43-101 Technical Report Borden North Project 2014 mineralized zone, which ranges up to 170m in true thickness, strikes east-southeasterly, dips -45° to the north and plunges approximately -15° to the east. *David S. Hunt, P. Geo. March 2, 2014; Technical Report on the Borden North Gold Property - Carty, Evans, Foleyet, Ivanhoe, Pinogami and Warren Townships - Porcupine Mining Division Ontario.